Learn, Listen, and Engage with the greatest minds in modern recruiting. We will be talking about AI-powered recruiting and sourcing techniques and tools that can save hours of your valuable time. If you are a recruiter, talent acquisition professional, or just interested in recruiting, this podcast is for you! Hosted by our very own - Derek Zeller. Every couple of weeks, we will publish interviews from some of the thought-leaders, practitioners, and recruiting experts from all over the country. We want to hear about their successes, failures, tools they are using to do their jobs better, and how they feel about AI and the use of more data in recruiting! This is going to fun and very informative! Look for "The Masters in Modern Recruiting" on iTunes and Google Play. You can also find us directly on SoundCloud. Episode 1 is here. 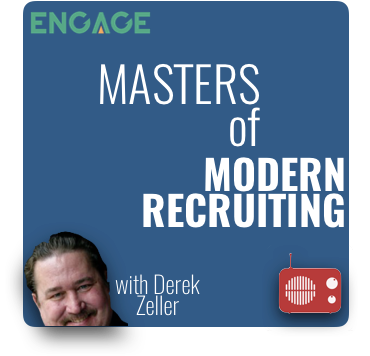 Welcome to the 1st episode of Masters of Modern Recruiting Podcast powered by ENGAGE Talent. Join us every 1 week or so to learn from the best recruiters in the world as they share their stories, successes, and failures. In this episode, ENGAGE Talent CMO Robby Gulri chats with show host Derek Zeller about the massive shifts happening in recruiting and why an “inbound” marketing strategy can lead you straight to spam. Derek: Hey what is going on recruiter maniacs? Derek Zeller here and welcome to the first episode of the Masters of Modern Recruiting Podcast. I’m Derek Zeller from ENGAGE Talent as I've said and I'm excited about doing this podcast also today I am joined by our enigmatic CMO Robby Gulri. Welcome Robby how are you man? Robby: Wow, Derek that's a big word for a Thursday afternoon here. Derek: We want to keep it classy Robby. Robby: I hear you so I am excited you know you and I were drinking a couple of beers a few months ago over in Vegas when you and I first met and we decided to do this podcast and here we are all the way in August and I am so excited to get this thing off the ground. So you know. Derek: In Vegas that was like my unveiling too right remember? You and I started almost the exact same time. Derek: We’re just kind of like two kids looking at each other like okay but we're going to take on the world here. Robby: Right we're going to change the world we're going to modernize recruiting and we're going to leverage technology and we're going to have fun in the process. So I think this is part of the fun of what we're trying to do here. Derek: So I can introduce Robby since most of the listeners probably know who I am. But Robby, he’s a master of bringing things to life together. A fantastic writer does some great stuff putting decks together things like that. He is a true CMO and cool thing about Robby too is that he comes from an AI background. Tell me a little bit about the background Robby? Robby: Yea you know I always say Derek when people ask me like how you got into marketing given your background. My background is actually in engineering and mathematics and computer science. I realized pretty early in my career that you know as fun as that was I saw the marketing and sales guys were having a lot more fun than I was. So over time I decided to kind of migrate over to the marketing side which for me is a perfect combination because it allows me to use kind of my right and my left brain. Allows me to apply some of the analytics and the numbers and the metrics of it all to do the things that you know we all want to do which is to grow the business and to help really elevate the brand. So you know I try to combine some of that right brain and left brain to try to execute as best as we can and having you on the team man it's been fantastic. Because I am NOT a recruiting expert or a talent expert I'm learning pretty quickly but you keep it real and I love the combination of the two of us in terms of what we bring to the table. Derek: Absolutely so let me explain to the audience why we're doing this podcast. There's lots of recruiting podcasts you know that are out there but I think one of the things we wanted to do when Robby and I first talked about this like you said back in SourceCon in Vegas. We wanted to do something a little bit more original it's a little bit more different and something a little bit faster. No real scripts it's just going to be kind of like chatting between two firms kind of situation if you're into that Zack Galifianakis show which I've always loved that's what we're shooting for. And we're going to be doing this about every two weeks initially eventually if it really takes off one off then we’ll by doing one a week. One of the other things we also will be doing is bringing people on bringing a week old masters of recruiting joining us some great people Suzanna Frasier, Amy Miller, Pete Radloff, Doug Monroe, Ronnie Bratcher probably going to try to get Shally Steckerl he's hard to get on the line. And the list goes on and on and on it's going to be Sourcers, Recruiters we may even bring on some Marketing folks. Maybe I’ll find Celinda Appleby here in Portland where I'm at and see if she wants to come on board and just chat. It's not so much an interview process, it’s just sort of us kind of talking about what's happening in the industry today and what they're doing their take on recruiting or modern recruiting that's the new one it used to be social recruiting now it's modern recruiting. Robby what do you think about Modern recruiting? Robby: I love that term because it implies that we’re doing things a little bit different, a little bit more cutting-edge and a little bit more innovative. You know leveraging the data, the AI, the automation all these buzzwords that we hear about and read about and see in action we want to bring that to the podcast. And I love the fact that we're going to be bringing in some masters as we like to call them. These people have lived it, they breathe it, they have seen it from soup to nuts and bringing those stories and that perspective and you know the lessons learned the successes and more importantly the failures I think is going to be really interesting and really cool. You know you talked about podcasts in general I love the Bill Simmons podcast. I listened to it regularly and it's just Bill Simmons bringing in special guests on a daily basis and he'll bring in his daughter he'll bring in his nephew he'll bring in Denzel Washington that's the last one I heard a couple weeks ago. And they just have conversations and I love that conversational thing we're not here to try to you know lecture or somehow teach you something you don't already know. But I think bringing on some of these really cool people who have some really cool stories will bring some value to the podcast world. Derek: That's awesome that's really, really cool I agree with you totally. Yeah social recruiting is funny to me because it's never been that social. It's just going on social and finding talent people. My only real question I'm going to ask you Robby, how do you feel about inbound marketing for a recruiter? Robby: You know you just can't wait around and see what happens you can't be reactive in this world especially given the job climate as it is. You have to be much more proactive so for me anytime somebody talks about inbound anything, hey I'm just going to wait around. It implies that I'm just going to wait around and see if I get an order or an email or a call in and then I'll respond accordingly and that just doesn't work and it doesn't fly in any industry much less recruiting. So I think one of the things we're going to talk about a lot over the next handful of podcasts is just some of the techniques and things that work around outbound recruiting. The complete opposite which is being more proactive being more contextual, being more personalized in the way that you communicate. You know don't you get those emails that you hate and you press “Delete” immediately which basically are so generic and so kind of cookie cutter you're like man they have no clue to who I am what I'm all about and what I like to do whether it's in your personal life or in your professional life. So we want to change that equation so for me as a marketer even when I'm trying to market ENGAGE and our capability it's all about reaching out making sure that you know people are aware of the things that we're doing instead of me just waiting back and trying to see if I can't get customers to call me. So I completely don't like the in the term inbound recruiting and I'm always a big proponent of velocity and just making sure that you're proactive and outbound about everything. Derek: Yes it's the spam world as we like to call it there's even groups that are like talking about anti-spam, and what most people don’t realize - maybe they're not technologists or technology recruiters, I mean you come from that background I come from that background - is that the smart people can immediately say well thanks for the spam email and then they put you in the spam folder which means that at some point you actually have something or they say “hey I'm actually looking”. Their email will block you so you've done yourself a disservice by sending somebody's just a crap email. Don't send something over that says like “Hey Becky I saw your resume today!”. I mean it's like really you saw my resume where? I saw your resume you know or maybe you'd be interested in this. If not maybe you know somebody. So why I'm like if I'm not interested you're not really giving me any incentive to help you by sending you to my friend or my colleague that may be looking because the email is so vanilla generic. You took no time out right? And quick plug for ENGAGE Talent that’s what we do, we do business intelligence. We tell you when we think based upon a set of data set points why an individual may be looking for a new gig and we have pretty much the most amazing success rate in people returning emails because we can even help you write and craft a good email for someone to respond to you. Robby you got anything else for me man? Derek talking because we talk all the time and we could do this all day long. You know we can do this for the next five hours and you guys will be bored I'm sure but we're going to bring in some really cool people and they may not be all in the recruiting world. It could be from the AI world and the analytics world and people who are really applying science. And one of the people that I was thinking about bringing is actually at some point is our head of data science Kristy who's doing some really interesting things on analytics and applying that to talent acquisition and I think for the folks that really get to get you know nitty gritty and want to hear some of the under the hood kind of stuff that maybe an interesting guest to bring Derek. So let's put that on the list but other than that man this is going to be fun and let's keep the ball rolling. Derek: Yea I would be beyond excited to get Kristy on the podcast she is so smart and just every time she starts talking I'm just like I'm in awe. She really is one of those really special people that you want to hear from because she knows what she’s talking about. She’s the real deal. Robby thanks for coming on man. I’m going to see you the next time we do this I guess. Robby: Absolutely have fun in Portland my friend. Derek: Recruiter maniacs thanks for listening in. Like we said this is going to be a free-flowing show, so go ahead and make your schedule a half an hour on first we might be 15 minutes we might be 45. You never know it will be taped so you can always just download and listen to it when you’re out there running on the treadmill or taking a you know half an hour for a quick lunch break. Recruiters we always take lunch breaks. And you know that’s about it man, thanks for listening and over and out.